Winner is a hugely successful online casino brand and since its establishment in 2009, it’s earned itself an excellent reputation. In 2014, Winner launched the Casino.winner.co.uk site specifically aimed at the UK market. Casino.winner.co.uk not only features a vast selection of cutting-edge casino games, it also provides players with the chance to enjoy Poker, Bingo, sports betting and live betting, all in one virtual space. Winner is powered by Playtech software and a no download and download option is on offer. For players who download the software, access to the full suit of over 300 games is available. There are also a selection of games optimised for mobile and players can choose the platform they prefer, along with the types of games they want to play. An app is available for iPhone or iPad and Android, and both offer an intuitive gaming experience in a portable environment. Players can use one account and wallet to access any of the Winner platforms, making it even easier to switch between devices and game options. Winner is renowned for offering players an incredibly comprehensive online casino experience and with over 300 games to choose from, there’s something for everyone to enjoy. There are a vast number of slots on offer, including popular Playtech Marvel titles such as Iron Man 2, The Avengers and the Incredible Hulk. Roulette, Blackjack, Baccarat, Craps and an assortment of classic casino games are listed, along with Vegas games that include a selection of perennial favourites. Scratchcards, Keno, Video Poker and arcade style games are all featured and the game selection is incredibly diverse. The Live casino hosts Blackjack, Baccarat, Roulette and Poker games and offers realistic, sophisticated real time gaming at its finest. Almost all games can be enjoyed in demo mode, however the live dealer games require players to wager real money. When it comes to rewarding players, Winner does so incredibly well. There’s a generous welcome bonus to get your real money gaming off to a great start and daily and weekly promotions make playing at Winner extra rewarding. Comp points and a VIP program make Winner an excellent choice for regular players and there are plenty of additional online casino bonuses up for grabs if you select this casino as your preferred gaming destination. Winner accepts more than 40 different banking options for deposits and withdrawals, making sure that every player’s transaction needs are easily accommodated. Credit and debit cards are accepted, as are a long list of ewallets and other payment mechanisms. Mobile banking is also available for players on the go. Winner is licensed and regulated by the UK Gambling Commission and meets the highest standards of safety and security at all times. SSL encryption protects player’s information and ensures that all data remains confidential. Support is also available around the clock and the Winner customer service representatives are well trained, efficient and professional. Players can get in touch by phone, live chat or email, or correspond via post. 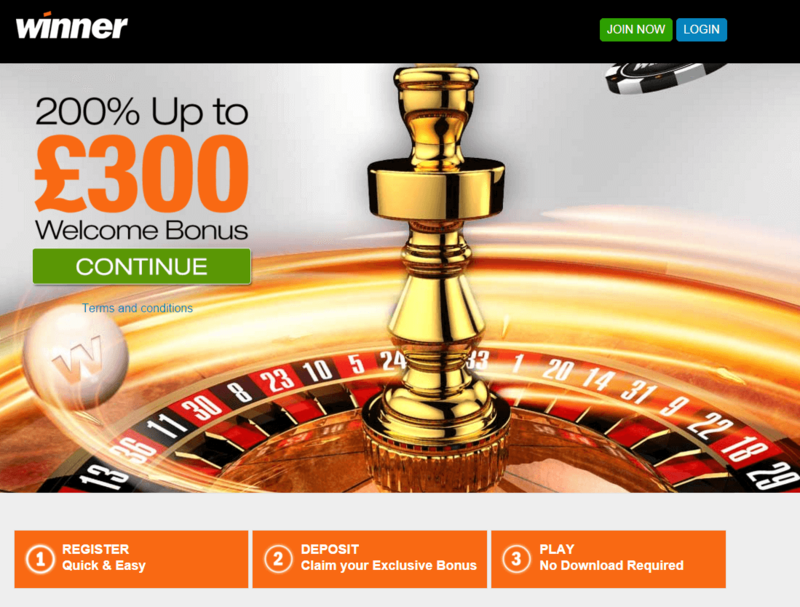 Winner offers superior online casino entertainment to all players and its sleek, stylish black and orange interface is user-friendly and easy to navigate. Ideal for beginners and seasoned players, this casino is one that scores highly in every area, and certainly deserves to be recommended.